The global WiGig market was valued at USD 1.3 billion in 2017 and is expected to reach USD 93.09 billion by 2023, at a CAGR of 103.78% over the forecast period (2018-2023). WiGig is one of the latest and emerging technologies (IEEE 802.11ad) that works in the bandwidth of 60GHz and delivers up to 7 Gbit/s (20 times faster than IEEE 802.11n standard connection). The widespread availability of digital multimedia content and its increased usage is driving the need for faster wireless connectivity. The increased penetration of computers and smart devices, coupled with the ability of WiGig to transfer data at higher speeds is opening various options, apart from just moving files. WiGig technology uses the standards and mechanisms of IEEE 802.11 and security based on Advanced Encryption Standard (AES). These standards help in the safe implementation of the technology in any compatible hardware, enabling higher efficiency and performance. However, shorter operating range, higher loss on chip, and cost-effectiveness of the product remain as challenges for the growth of this market. An immense amount of research is being conducted by many technology giants like Intel and Cisco in this field and their efforts are expected to overcome these challenges in the coming future. There has been an increase in the penetration of internet and mobile devices among the masses. This can be supported by the fact that Sub-Saharan Africa has 420 million unique mobile subscribers as of 2016, which equals to a penetration rate of 43%. It is observed that the mobile ecosystem contributed to 4.5% of the overall global GDP in 2017. In 2017, the mobile ecosystem also observed a large amount of activity with regard to the venture capital fueling the rapid pace of technological innovation and service. 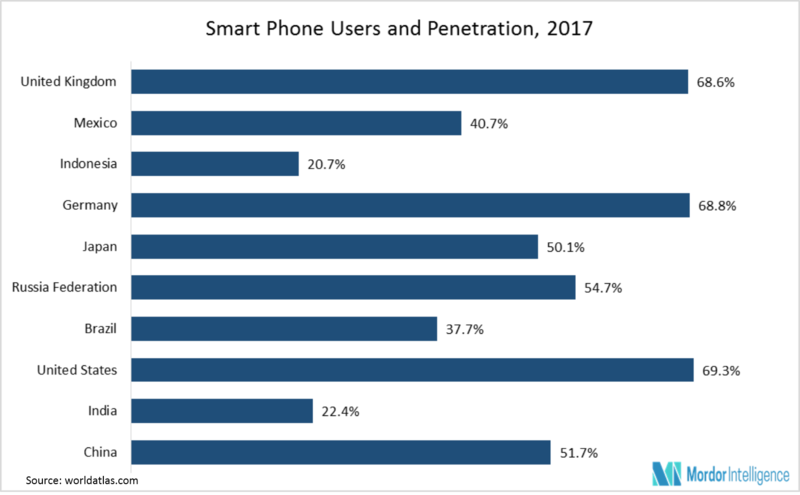 The above-mentioned trends are expected to increase the penetration of mobile or portable devices. As WiGig market growth is directly linked to the increased penetration of handheld devices, the market for WiGig is expected to grow at a rapid rate during the forecast period. The demand for faster wireless network in the healthcare sector is driven by factors like the increase in data inflow with the deployment of electronic health records and the rising use of connected equipment. Hospital staff and doctors are increasingly using mobile devices to communicate with and engage patients. The increasing need for wireless access by visitors, patients, and support staff is also expected to drive the market for WiGig. This increasing demand and promising growth is driving hospitals to adopt better wireless technologies to cater to the data needs, without any downtime or disruption. North America holds the major share in the WiGig market. In North America, the United States dominated the WiGig market, followed by Canada. North America is the hub for all major enterprises in the world. The increasing network speed and growth in IoT (Internet of Things) are driving the demand for WiGig connectivity in the region. November 2017 - Cisco and INTERPOL announced an agreement to share threat intelligence as the first step in jointly fighting cybercrime. Through this alliance, the two organizations are expected to develop a coordinated and focused approach to data sharing. March 2017 - NEC Corporation provided government agencies in Malaysia with hands-on cyber defense training. This was aimed at enhancing the abilities of system administrators in government agencies to effectively handle the increasing threat of cyber-attacks. Major Players: Cisco Systems Inc., NEC Corporation, Panasonic Corporation, Qualcomm Atheros, Intel Corporation, Broadcom Corporation, Agilent Technologies, Silicon Image Inc., Advanced Micro Devices, Inc. (Nitero), and Blu Wireless Technology, among others.